Endot yellow polyethylene gas pressure pipe and tubing is manufactured and tested to meet or exceed the national standards for gas pressure pipe and pipelines as published by The American Society for Testing & Materials and the Federal Government, including standards ASTM D-3350, ASTM D-2513, and The Mininum Federal Standards for Gas Pipelines. Endot's yellow gas pressure pipe is manufactured using Bi-modal MDPE (medium density polyethylene) which exceeds industry standards, and provides excellent environmental streess crack resistance and outstanding long term performance. 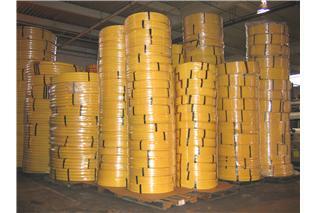 All Endot Yellow Gas Pipe is produced using DOW Chemical DGDA 2420, Bi-Modal, MDPE resin. Bi-Modal resin provides a significantly higher level of stress crack resistance and RCP performance than standard mono-modal materials. Endot Yellow Gas Pipe is UV Stabilized for outdoor storage prior to installation with a minimum of 3 years UV stability. Endot Yellow Gas Pipe is Certified by NSF to meet the requirements of the Uniform Plumbing Code. Endot Yellow Gas Pipe is specifically designed for natural gas and liquid propane distribution. To learn more about Endot MDPE Gas pipe and tubing please contact us at 1-800-44 ENDOT (800-443-6368) or email your request to info@endot.com.